Patients with dengue will have a history of living in, or recent travel to, a region where the disease is endemic. The incubation period is 3-14 days (average, 4-7 days); symptoms that begin more than 2 weeks after a person departs from an endemic area are probably not due to dengue. Many patients experience a prodrome of chills, erythematous mottling of the skin, and facial flushing (a sensitive and specific indicator of dengue fever). The prodrome may last for 2-3 days. Children younger than 15 years usually have a nonspecific febrile syndrome, which may be accompanied by a maculopapular rash. Classic dengue fever begins with sudden onset of fever, chills, and severe (termed breakbone) aching of the head, back, and extremities, as well as other symptoms. The fever lasts 2-7 days and may reach 41Â°C. Fever that lasts longer than 10 days is probably not due to dengue. Re: What are the symptoms of dengue? Rash in dengue fever is a maculopapular or macular confluent rash over the face, thorax, and flexor surfaces, with islands of skin sparing. The rash typically begins on day 3 and persists 2-3 days. Fever typically abates with the cessation of viremia. Occasionally, and more commonly in children, the fever abates for a day and then returns, a pattern that has been called saddleback fever. A second rash may occur within 1-2 days of defervescence, lasting 1-5 days; it is morbilliform, is maculopapular, spares the palms and soles, and occasionally desquamates. Recovery is complete but slow, with fatigue and exhaustion often persisting after the fever has subsided. The convalescent phase may last for 2 weeks. Patients are at risk for development of dengue hemorrhagic fever or dengue shock syndrome at approximately the time of defervescence. Abdominal pain in conjunction with restlessness, change in mental status, hypothermia, and a drop in the platelet count presages the development of dengue hemorrhagic fever. Of patients with dengue hemorrhagic fever, 90% are younger than 15 years. The initial phase of dengue hemorrhagic fever is similar to that of dengue fever and other febrile viral illnesses. Shortly after the fever breaks (or sometimes within 24 hours before), signs of plasma leakage appear, along with the development of hemorrhagic symptoms such as bleeding from sites of trauma, gastrointestinal bleeding, and hematuria. Patients may also present with abdominal pain, vomiting, febrile seizures (in children), and a decreased level of consciousness. If left untreated, dengue hemorrhagic fever most likely progresses to dengue shock syndrome. 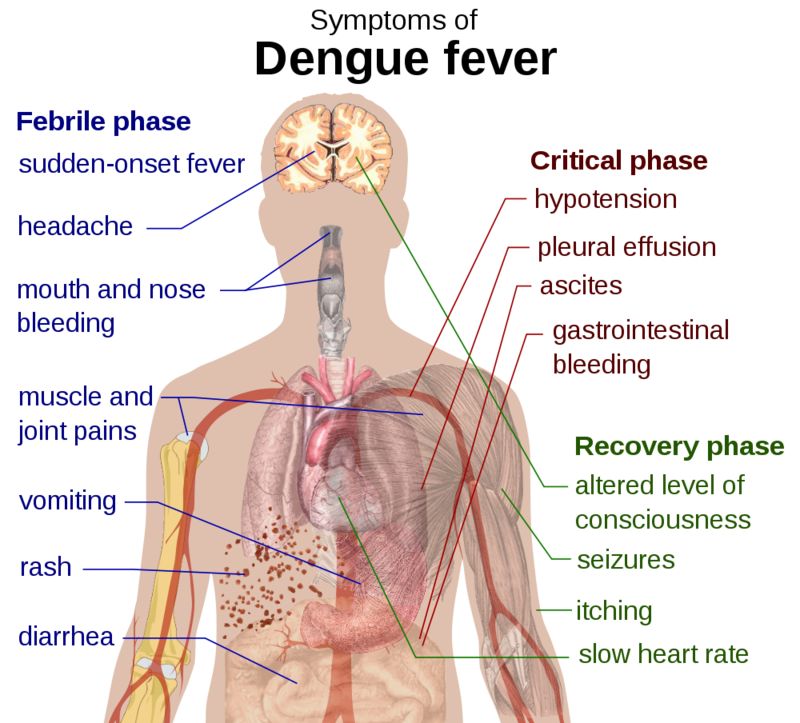 Common symptoms in impending shock include abdominal pain, vomiting, and restlessness. Patients also may have symptoms related to circulatory failure.